The Cyclone Marching Band entertains hundreds of thousands of fans across Cyclone Nation each year, and we couldn't do it without the support of you - our greatest fans! We have a variety of different ways to support the band, from being our biggest cheerleader in the stands of Jack Trice Stadium and Hilton Coliseum to becoming a transformational donor to our program. The Cyclone Marching Band has a "tradition of excellence" dating back to 1881. The band has performed all over the country at exhibitions and bowl games in support of music education and Cyclone Athletics. The band has traveled overseas twice - once in 2000 as a featured guest in the Millennium Parade in London, England and again in 2016 when the band was selected to represent the United States of America at the annual D-Day ceremonies in Normandy and Paris, France. The band has been heard commercially both by recording the Ray Charles Pepsi Jingle in 1991 and winning the "Coach Contest" to record the theme song to the hit television show "Coach" in 1995. Most notably, the Cyclone Marching Band was recently selected to receive the Sudler Trophy recognizing excellence in collegiate marching band and a significant contribution to the American way of life. This trophy is awarded every two years, and Iowa State will hold the trophy from 2017-2019. This is the highest honor a college marching band can receive, and we are humbled to have been selected. When you give to the Iowa State University Cyclone Football 'Varsity' Marching Band, you are directly helping the members of the band to have a world-class experience in our band program. With over 400 students involved in the Athletic Band program, your gift has a significant impact on the membership of the band, and the way that it contributes to Cyclone Nation. 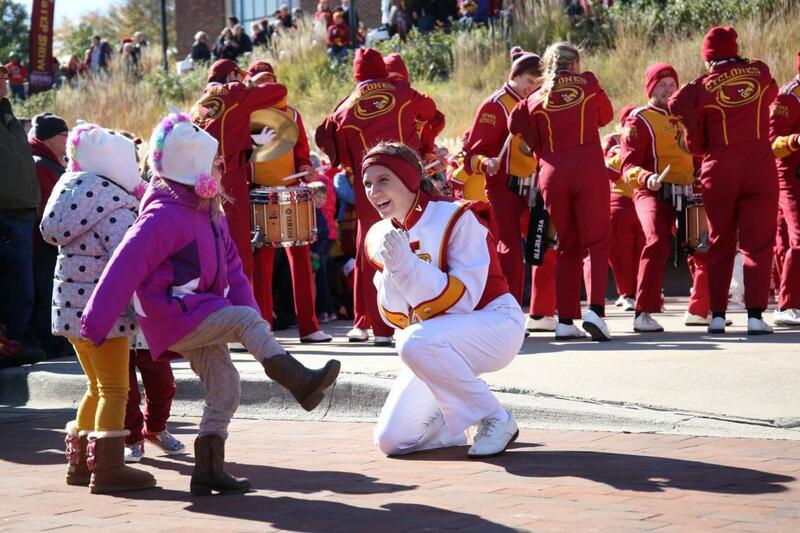 Whether it’s a high-spirited halftime show at a football game in Jack Trice Stadium or a touch of “Hilton Magic” at a basketball game, the Cyclone Bands are providing entertainment and university pride to every spectator in the audience. With their superior showmanship, the Cyclone Bands are regarded as some of the finest collegiate bands in the country. However, each year the bands operate on a very limited budget. 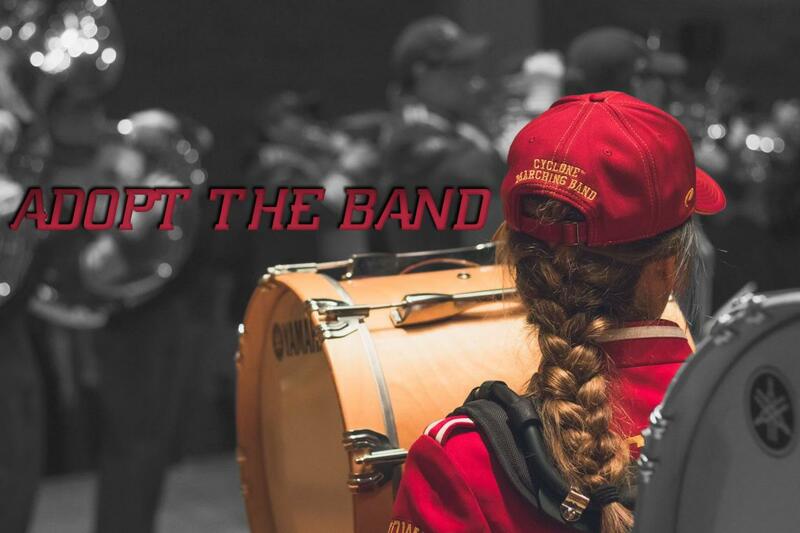 The annual Adopt-the-Band campaign is your chance to show your pride in the Cyclone Bands and the outstanding men and women who represent the university with such talent and dedication. When you Adopt-the-Band, your gift can support a specific position in the marching band formation or concert band seating chart. Or if you prefer, you may simply specify which instrument you are interested in adopting. A gift of any amount helps the band tremendously, please consider giving to the Pride of Iowa State! Click HERE to Adopt The Band! Or, call the Iowa State University Foundation at 515-294-4607 or toll free at 1-866-419-6768. Cyclone Marching Band Fan Of The Game! Have you ever wanted to conduct the 350-member ISUCF'V'MB? This is your chance! We are starting a new program in 2018 to honor a “Marching Band Fan Of The Game” where we recognize your contribution to the band at the CMB Step Show before each home game kickoff! You’ll spend the entirety of our pregame process with the CMB - including our pregame rehearsal, pregame meal, and you and seven friends will be our special guests of honor at the CMB Step Show! With a special reserved standing area, you’ll have front-row access to the best of the CMB prior to entering Jack Trice! During the step show, we’ll have you conduct the band in ISU Fights and lead us in a parade to Jack Trace Stadium for kickoff! To become a part of this new tradition, contact mgolemo@iastate.edu or call 515-294-0394. Spots are filled on a first-come, first-served basis and all donations to the fan-of-the-game program are tax deductible!